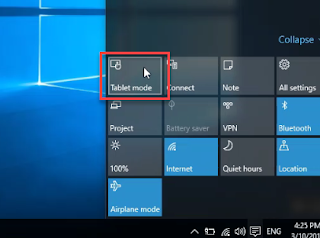 Restore missing desktop icons on windows 10, Disable tablet mode in windows 10. 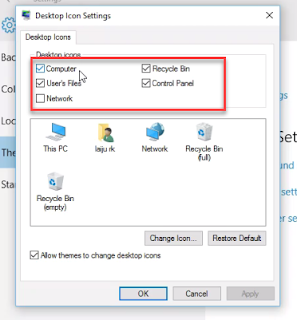 This video will help you to restore desktop icons and user files to windows 10 desktop. First right click on desktop and click on 'View' then check on 'Show Desktop Icon'. If this not solved your problem, right click on desktop and click on 'Personalize'. click on 'Themes'. then click on 'Desktop Icon Settings'. 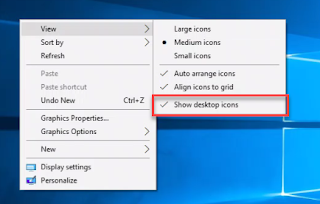 Here you can choose the desktop icons to pace on desktop. Some times if your windows 10 is in tablet mode, you cannot access your desktop files and icons. In this situation you have to disable the 'Tablet Mode' Then the desktop icons will be available on your windows 10 desktop.